I thought about starting the year off with a healthy dinner, or a smoothie recipe, or even a low sugar treat. But then I thought, who am I kidding? 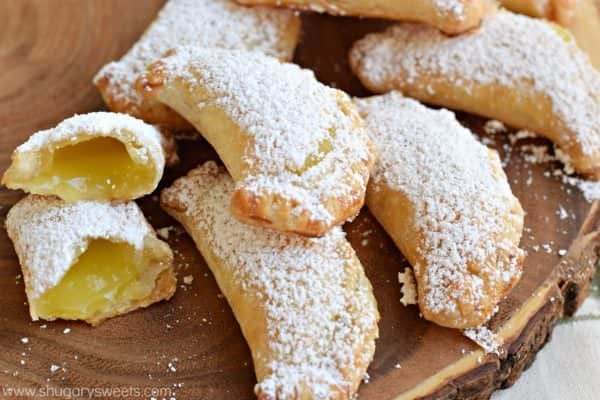 These Lemon Hand Pies have been sitting here waiting to be shared for months! 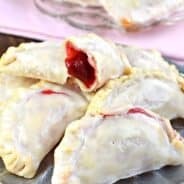 If you loved my other flavors, including these Peach Hand Pies , these Blueberry Lemon Hand Pies, and this Berry Hand Pies and of course these Apple Hand Pies..then you’ve got to give the lemon a try! It’s up to you how easy you want to make these. For today’s recipe I used store bought refrigerated pie crust and canned lemon pie filling. However, if you have the extra time, I highly encourage you to make this homemade lemon curd. It’s worth it!! Unlike my other hand pie recipes, today’s recipe does not have a glaze on top. Instead I added powdered sugar, which I think pairs nicely with the sweet lemon filling! As I sit at my desk and look at my blank calendar for the year, I’d love to hear from you all as to what recipes you’d like to see? Do you have a tried and true family favorite that you want me to try? Email me your recipe (shugarysweets@yahoo.com) and I’d love to try it and share it on the blog! I’m always looking for new inspiration, and I find family recipes are seriously my favorites. There’s a reason they become a family favorite…everyone MUST love them! Happy New Year to all of you! May the new year bring you joy and happiness! 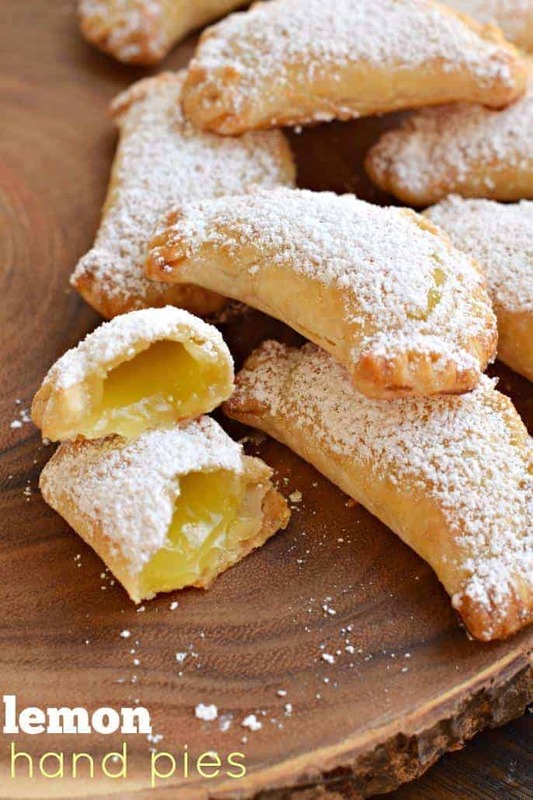 Lemon Hand Pies: flaky, baked hand pies with a sweet lemon filling! 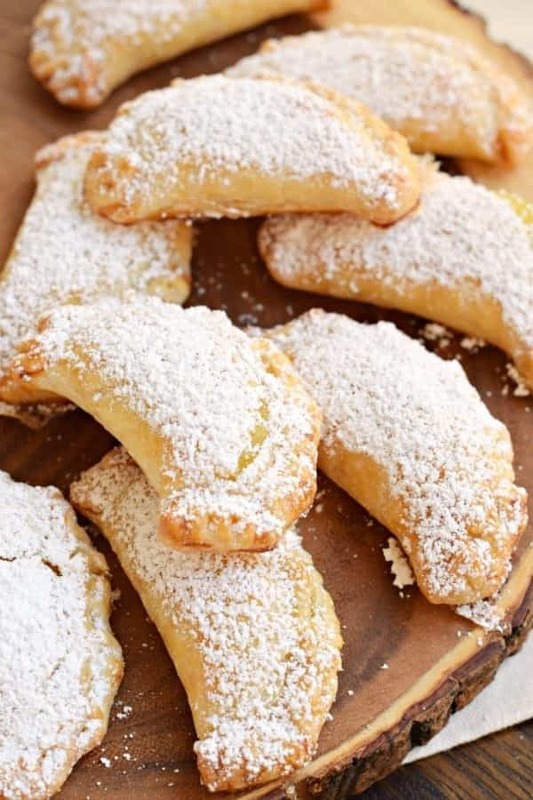 Don't forget the dusting of powdered sugar on top! Using a 1 tbsp cookie scoop, drop lemon pie filling into center of each pie crust circle. Fold in half and pinch edges completely. Fold pinched edges over and press with the tines of a fork to seal. Poke hand pie with fork once, to prevent bursting. Remove cooked pies from baking sheet and cool completely. Sprinkle generously with powdered sugar and enjoy. These are great refrigerated and served chilled. I actually have one of those empanada/hand pie crust folder things. Your hand pies would be perfect for that tool! And I totally agree that homemade lemon curd can’t be beat! What??? I must find this tool…I make a lot of hand pies! 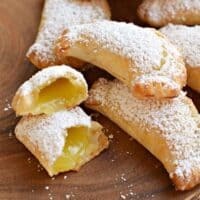 I used to love the cheapie hostess lemon hand pies. I am sure that these are a million times better, but that they would satisfy that nostalgia too! YES. I could eat those Cherry ones every single day!!! 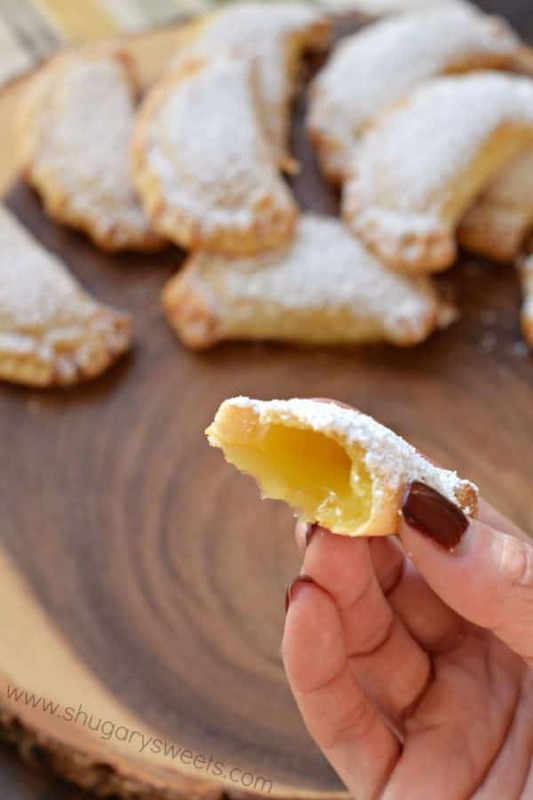 No surprise that you added a lemon hand pie to the list of your awesome mini pies! Love the powdered sugar on top too! Bring me some when they are ready. Yummy!! 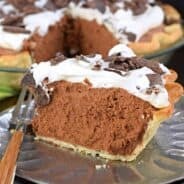 Looks delicious but it Is very aggravating when you want to see a recipe but feel like you are on a scavenger hunt looking for it! They are pretty much always at the end. Not much of a scavenger hunt if you know where to find them! Cheers! I love lemon! These look amazing! Mmm, I used to love the hand pies you could buy in the store! I’m sure these would taste much better. Thanks for sharing. What sort of pastry is used not sure we can buy this pastry in Australia? Do we use short crust or puff pastry? Thanks for sharing! I love anything lemon. Can’t wait to make these! These look delightful! One question, is there a substitute for pie crust? I’m not sure I’ve ever seen it here in the UK (I’m in London). Tiffany did you did a substitute? It’s actually easy to make a pie crust. 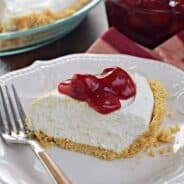 The foodchannel.com will have recipes. I think that’s what is used for the meat pies in GB, and maybe the crust on Beef Wellington. I would like to do these for my sisters bridal shower and I was wondering if I can do it ahead of time and freeze them? I was wondering if you can make these ahead of time and freeze them? I signed up but can’t get this mini lemon pie dessert. Can I freeze the Lemon Hand Pies? If so how long? Misprint or did I miss something 2 boxes, 6 circles per roll/box = 12 but yield is 24??? Pie crust is a short crust for England and AU. They freeze ok, tried that last weekend. These look so good! I always loved little lemon pies! This is the perfect lil sweet snack.???? I would use other pie filling flavors too.